My favourite Rum is distilled here and I wanted to go on a tour of the distillery. One disappointed, the other did not. 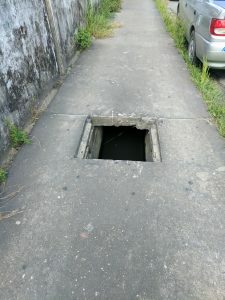 Watch out for the open sewers while walking around town! Exiting the airport with no local currency in hand and not wanting to get ripped off by the taxi drivers, I found the #42 minibus to take me into town. Problem is, the smallest note I had was $20USD. I ended up essentially hiring the entire minibus to take me straight to my hotel. The driver agreed not to pick anyone up along the 45 minute ride into town. Driving in Guyana is fast and furious. Peering over my drivers shoulder to see how fast we were going on an undivided two lane road, the speedometer was pushing 140km/h. Buckle up and don’t fight it! I stayed at the Signature Inn in Alberttown, a safe neighbourhood in Georgetown. If you plan on going to Suriname and need to pick up a tourist card, the hotel is less than a 2 min walk away. I had no issues walking to all the sights in town from here, during the day of course. At night, stick to taking a taxi. I ended up paying $500GYD for most destinations in the city. Guyana is at the intersection of English, Caribbean, and east Indian influences and culture. As such, their food is highly influenced by these regions. 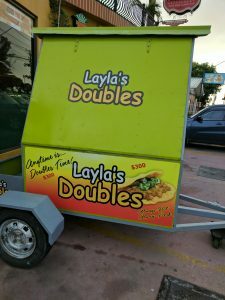 I found a street vendor that was selling Doubles. Make sure to grab two or three. They are small! Originally from Trinidad and Tobago, Doubles are flat fried bread filled with curried chickpeas. Simple and delicious. One of my favourite places to grab food, although maybe a little bit touristy, was Palm Court. Try their jerk chicken, it’s amazing. 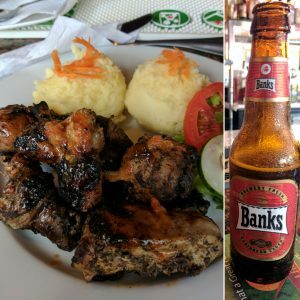 Jerk chicken with Banks beer. Perfect combination. The market’s famous clock tower. 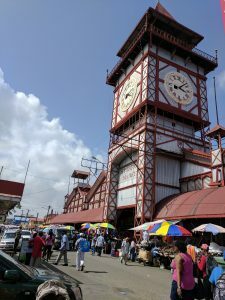 One sight not to miss is Stabroek Market. Hold on to your stuff and keep your eyes peeled. Everyone is going to be haggling you for a ride or to buy something. This is where the majority of Georgetowners buy their goods from. It’s tight quarters once you’re in, but the sights and smells are amazing. Take your time and peruse all of the booths. I took a boat (the dock is behind the market, a little tough to find) to Vreed en Hoop for $100GYD. The drivers take the safety of their passengers seriously and make everyone wear a life jacket for the 10 minute ride. On the other side, you’re once again hounded by taxi drivers. Just walk past them and check out the shops and restaurants. It’s worth the trip, but you wont spend more than 1-2 hours here, it’s a small town. My attempts at getting a tour at the Demerara Rum Company failed. One of the plights of the solo traveller, I was unable to find five other people to form a group. Calls and emails to tour companies also went unanswered. Shame. 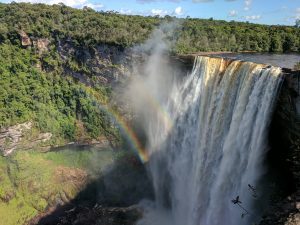 I was, however, able to secure a seat to Kaieteur Falls. Don’t book with a tour company, instead book with the airline directly. I was able to secure a spot on a Air Services Ltd. charter flight to the falls. Since everyone needs to be escorted by a park guide, there is no point in paying extra for a tour company to get you out there. The tour is two hours and includes visiting three vantage points to see the falls. My next destination is Suriname and I really wanted to take ground transportation east to the border. I was reminded how much I loved flying when I went to Kaieteur falls that I decided to take a Gum Air flight directly to Paramaribo’s downtown airport. Give them an email and they will be able to get you there for around $47,000GYD.